SeoulLovely: Dating Culture in Korea: WTF are Couple Shoes? Hi Lovelies! I want to take a few minutes to talk about an aspect of Korean dating culture that I found strange at first, but now I think is totally charming: matching EVERYTHING for Korean couples! Well, you don't have to be Korean. It's just acceptable for couples who live here to take the lovey dovey matchy-matchiness to the next level in a way most of my North American friends would find revolting. Exhibit A: matching couple tees. Check them out here! It's considered perfectly normal here for couples to wear matching clothes, and I see plenty of cool guys walking around Seoul wearing matching t-shirts, hoodies, or even full outfits as their girlfriends and thinking nothing of it! It's so common here that no one even blinks. If you just search "couple tees" or "couple hoodies" on Amazon or ebay (I think ebay has cuter options), you'll likely find a lot of cheezy "His" and "Hers" couple themed options, but it doesn't have to be that lame. Shirts don't even have to be the same color/design either. My BF and I have couple polo shirts--his is grey and mine is red. So what level of this cuteness am I personally able to indulge in? My BF was a initially reluctant to embrace the idea of couple clothing, labeling it "lame" and "for kids" haha. But I finally talked him into letting us get couple shoes around our 300 days with the compromise that he chooses the style. We were initially going to get some Adidas Superstars, which were really trendy this spring, but EVERYBODY in Seoul was wearing them as couple shoes! So we found some really nice Reeboks that actually had his size (290 is big in Korea!). I think most couples choose men's styles because they go smaller, but women's sizes definitely don't go higher! I'm a US size 9 and can hardly find my size anywhere in Korea. They were a good compromise--not too girly but not too manly. Perfect for both of us! My personal favorite is couple hair color!! This is less common, but I see it sometimes around Hongdae--a Seoul hub for street style and funky fashion trends. I would do this in a heartbeat! Image courtesy of my girl Sara--check out her awesome Instagram here! Another popular item here in couple rings, which is where my BF sadly draws the line (he has a strong no jewelry on dudes policy). However, I think it's super cute! It's common here to get couple rings as early as your 100 days anniversary! People tend to wear them like a wedding ring on their left ring fingers, so it was a bit confusing for me when I first got here. I was at a university and lots of the students had couple rings, so I'd ask "Oh, are you married?" They just laughed and explained. 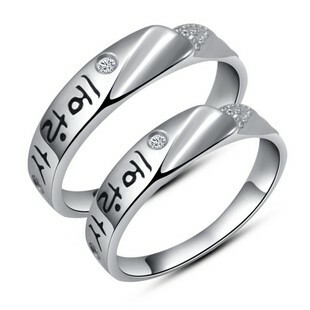 There are places around here in Hongdae where you can get couple rings specially engraved, but outside of Korea you can buy them online at tons of stores. You can find these here, but they're everywhere. Get a sweet message engraved! Maybe BF will change his mind about the couple rings kkkk. By the way, I should say a word to explain the anniversaries in Korean dating culture! Unlike American style dating, which usually considers 1 year (maybe 6 months) as the first big dating milestone, Korean couples usually celebrate each hundred days leading up to 1 year. And I mean really celebrate! For our 100 days we went on our first road trio together to the beach for romantic 3 day weekend. So, Korean dating culture is on a different scale than Western dating culture, and I love every minute of it! I didn't love it when I was single, however. It's hard not to give into your forever alone feels watching cute couples splitting heart shaped pizzas at Pizza Hut or snuggling in one of the two-seater couple seats at the movie theaters. The truth is, Korea markets to couples in so many ways, and appreciation for all the lovey dovey merchandise and menus probably won't be there until you're in a relationship. Or, do what I did, and try to appreciate the cute quirkiness of it without participating. When you're able to walk hand in hand with someone wearing the same shirt as you, it'll feel all the sweeter for the waiting. wow That's great information. Thanks for sharing this blog. I did a search and found your blog and glowing review. It's been a big help! Thanx!